Morning Gymbonians, and HAPPY UPDATE WEDNESDAY! Up first is PETS! 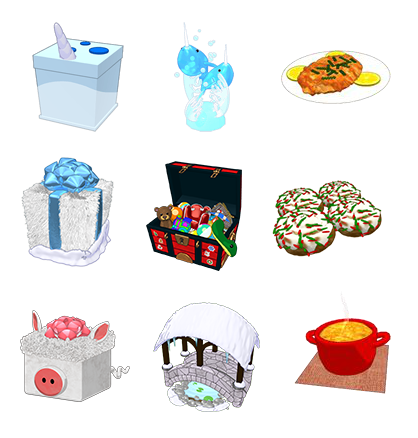 Top row: Narwhal Gift Box, Narwhal Ice Sculpture, Flatfish Fritters. Middle row: Snowy Retriever Puppy Gift Box, Christmas Toy Trunk, 0oey Gooey Cinnamon Roll. Bottom row: Wooly Piglet Gift Box (Webkinz is spelling it this way, so don’t yell at me for misspelling “woolly”! ), Snow Covered Bridge, Cheesy Pasta Bake. Next is WKN stuff for December and January, and some more Be Merry theme. Top row: Mod Ebony Low Bed, Blue Zircon Mosaic Tile, unnamed dresser that we’ll just call Mod Ebony Dresser, unnamed tile that we’ll call Garnet Mosaic Tile. 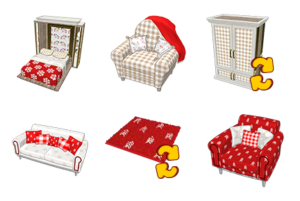 Bottom row: Be Merry Bed, Be Merry Nook, Be Merry Dining Chair, Be Merry Dining Table. There’s also a Be Merry Wardrobe, but the image is not in the system yet, sorry! Speaking of Christmas themes, here’s the Christmas Cabin theme, which I’m sure you’ve already seen! 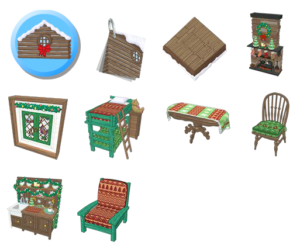 Top row: Christmas Cabin Theme icon (which is what you’ll be looking for in the WShop), Christmas Cabin Wallpaper, Christmas Cabin Flooring, Christmas Cabin Fireplace. 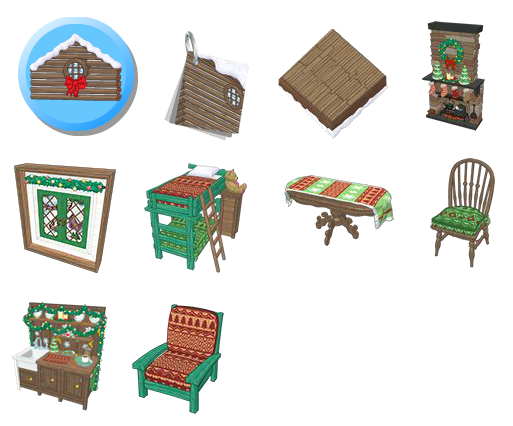 Middle row: Christmas Cabin Window, Christmas Cabin Bunk Bed, Christmas Cabin Dining Table, Christmas Cabin Dining Chair. Bottom row: Christmas Cabin Kitchen Counter, Christmas Cabin Armchair. Let’s keep going with Christmas! Top row: 2018 Christmas Gift Box, Peppermint Candy Cane, SantaKinz Slippers, Festive Tree Toque. Bottom row: Candy Cane Cap, SantaKinz Cookie Jar, Snowflake PJ Top, Snowman Snow Globe (NEEEEEED!). 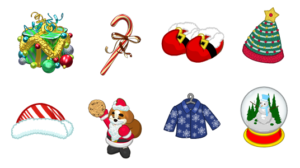 The gift box is this year’s Christmas Gift, and I have a feeling the Peppermint Candy Cane and SantaKinz Slippers are in the box. 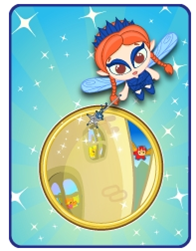 The toque, cap, cookie jar, top, and snow globe feel like Ms. Birdy Countdown items. More Christmas! 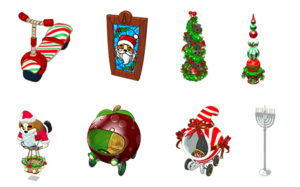 Top row: Striped Scooter, SantaKinz Stained Glass Window, Pine Garland Column, Ornament Column. Bottom row: SantaKinz Hot Air Balloon, Cranberry Car, Candy Cane Elf Car, Ornate Menorah. 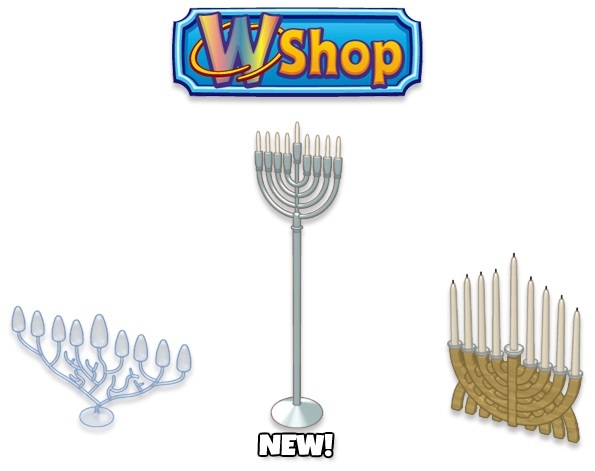 This feels like estore stuff, except the menorah, which should be in the WShop as I type this. Yet more Christmas! Top row: Green Elf Hat Cottage, Holiday Pudding Cottage (so cute! ), Holiday Tree Cottage, Reindeer Cottage. 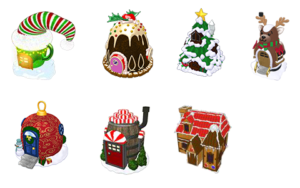 Bottom row: Ornament Cottage, Peppermint Cottage, Gingerbread Cottage. 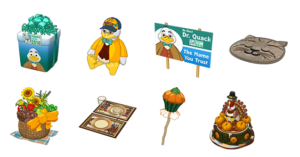 This feels like mostly stocking/promo items. The Ornament Cottage goes with the Ornament Column above, and the Reindeer Cottage goes with the Reindeer theme from a couple of Christmases ago. 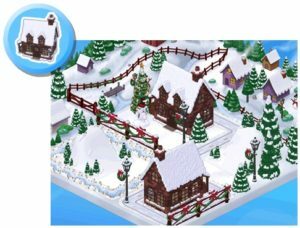 I like the WShop Gingerbread Cabin wayyy more than this new Gingerbread Cottage, lol! While we’re in the holiday spirit, let’s look at some candy trees! 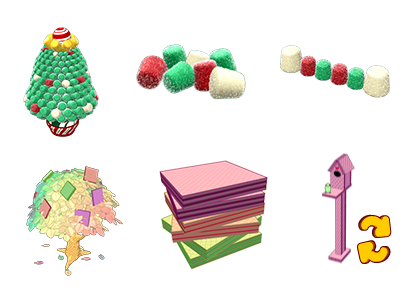 Top row: Holiday Gumdrop Tree, Holiday Gumdrops, Gumdrop Fence. Bottom row: unnamed candy tree, unnamed candy tree food, unnamed candy tree tie-in birdhouse. The unnamed stuff is GORGEOUS! and is probably January’s candy tree. Let’s move on to a closely related holiday: WINTERFEST! 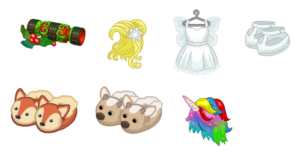 None of this stuff is named yet, so I’m making a wild guess that it will be Winterfest, but my wild guesses are usually pretty accurate, so yeah. We have what looks to be a road/snowmobile track tile that is rotateable, three creek pieces that are just the Countryside Creek tiles recolored (Lazy! ), and 2019’s Winterfest cookies in 3-pack, 6-pack, and single. More presumed Winterfest! 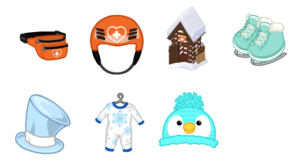 Also not named yet, but it looks like a ski rescue belt pack, ski rescue helmet, ski rescue station, (recolored) green ice skates, snowman top hat, snowflake onesie, (recolored) blue penguin toque. It’s so lazy of them to recolor the penguin toque, considering they haven’t even released the other two penguin toques yet! How ’bout some dispensers for the collectors out there? 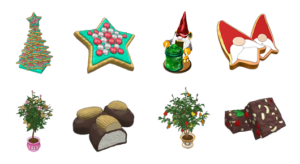 Top row: (recolored) Holiday Cookie Tree Dispenser, Holiday Sugar Cookie, GnomeKinz Cookie Dispenser, Gnome Hat Sugar Cookie. Bottom row: Almond Patio Plant (NEEEEEEEEED!!!!!!! ), Almond Marzipan Chocolate, Cashew Patio Plant (NEEEEEEEED!!!!!! ), Cranberry Cashew Fudge. I will definitely be getting the patio plants, which are most likely promo, and I bet my little food collector talks me into the GnomeKinz Cookie Dispenser, lol! Some random estore newness. This stuff isn’t named yet, but will probably be a mini-theme released in the January Sale and January BOGO sale. Speaking of estore themes, how about a little Moonlight Sparkle? This theme will be part ?? theme, part regular estore, and part stocking. Ugh! I feel bad for anyone trying to collect all of this! 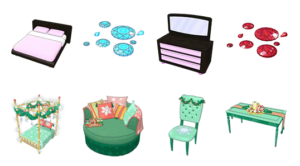 Top row: Moonbeam Sparkle Wallpaper, Moonbeam Sparkle Flooring, Moonbeam Sparkle Sleigh Bed, Moonbeam Sparkle Curtains. 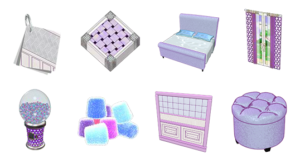 Bottom row: Moonbeam Sparkle Dispenser, Moonbeam Gumdrops, Moonbeam Sparkle Wall Divider, Moonbeam Sparkle Pouf. This stuff is probably all ?? stuff except the wall and floor, which will be regular estore. More Moonbeam Sparkle! Top row: Moonbeam Sparkle Fireplace, Moonbeam Sparkle Piano, Moonbeam Sparkle Dining Chair, Moonbeam Sparkle Car. 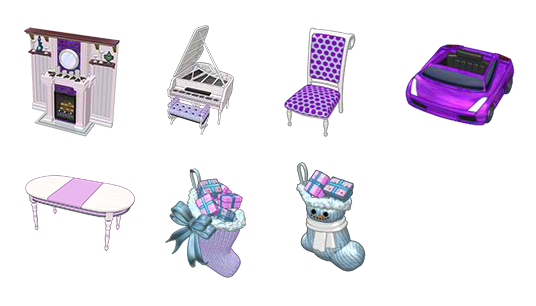 Bottom row: Moonbeam Sparkle Dining Table, 2018 Merry Moonbeam Stocking, 2018 Sweet Snowman Stocking. The moonbeam stuff is some combination of regular estore and stocking, can’t tell which is which yet. And that adorable snowman theme I showed you last time is now confirmed as stocking, at least partially. I can’t be sure which items from the theme are stocking and which are regular estore. More random newness. Most of this is not named yet, sorry! Top row: three unnamed jingle bell horse/reindeer bridles, unnamed dresser. Bottom row: unnamed poster and framed version of the unnamed poster, which is also unnamed, lol, and a Snowy Retriever Puppy Medallion. This says to me that the Snowy Retriever Puppy is a pet that is only available by collecting its medallions, ugh! Yet more random newness. 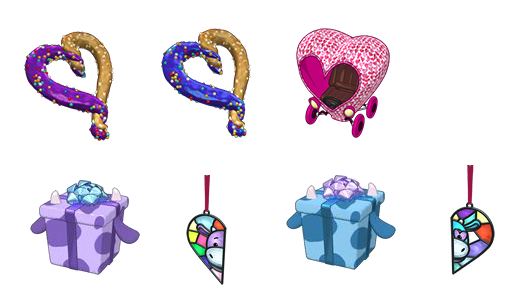 None of this is named yet, but it looks like we have two Valentine’s Day pretzels, one Valentine’s Day car, and two gift boxes/pet boxes featuring cows and Best Friend-type wall hangings. Not sure if these boxes are for new pets or are just gift boxes that will be floaty clicky items. And finally, some random newness for Spring! None of this is named yet, but it looks like a new ?? 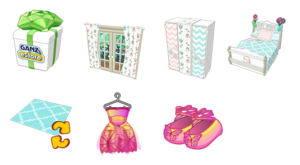 Box theme, and a (recolored) new butterfly outfit that might be spring mystery. HUGE NEWS for all of those players who’ve been waiting a long time to better organize their houses! We’re finally introducing a Moving Rooms feature to the House Map. 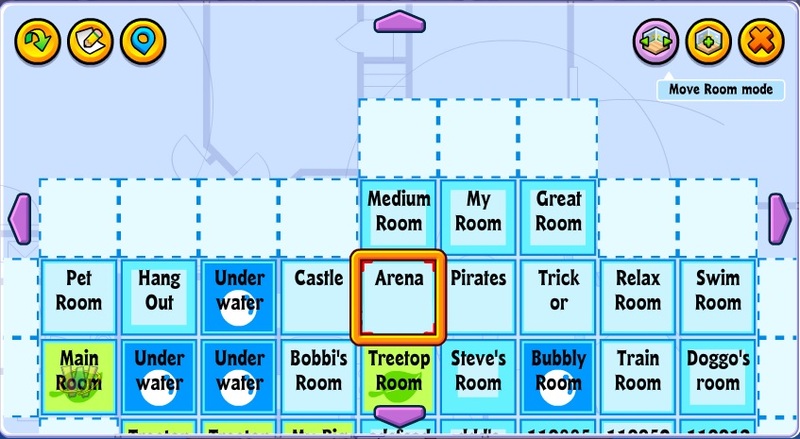 Deleting Rooms is still planned for the future, but this new feature is a giant step forward in helping to make those sprawling House Maps more manageable! 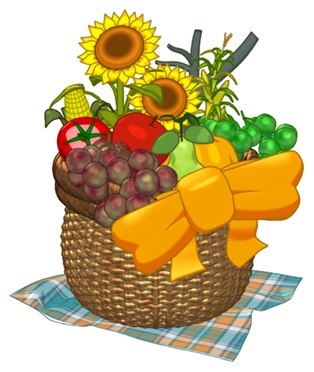 Make sure you log in to your Webkinz account any time on Thursday, November 22nd (on either Webkinz.com or the Webkinz mobile app) to receive your 2018 Thanksgiving Basket! The KinzStyle Outlet now has 3 limited edition holiday glasses: Cheerful Tree Glasses, Festive Menorah Glasses, & Jolly Holiday Glasses! 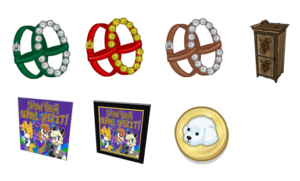 You’ll also find these great glasses in the mobile WShop on the Webkinz mobile app. Pick up your pair before they’re gone on January 16th. 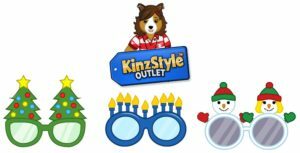 Have you your pet line up to meet SantaKinz starting December 1 before Christmas Day to tell him what they want for Christmas! 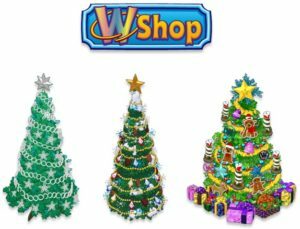 Our NEW fan-voted Christmas Cabin theme also arrives in the WShop on December 1st! 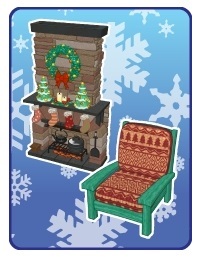 Make sure you collect all of your favorite pieces from this cozy Christmas room theme before they’re gone on January 1st! 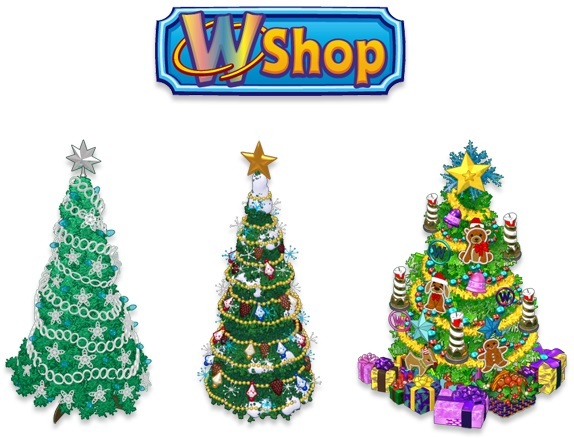 Returning to the WShop (and the Webkinz mobile app) this holiday season, are 3 classic Christmas trees: Silent Night Christmas Tree, Countryside Christmas Tree, or Town Square Christmas Tree! Returning exclusively to the Webkinz mobile app for the month of December is our previous Countryside Christmas room theme! Bring the outdoors inside this holiday season by decorating your own winter wonderland! 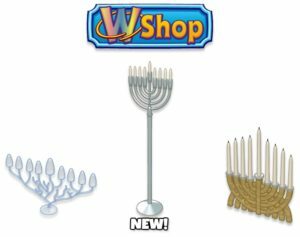 If you light the menorah at this time of year, you’ll be happy to find 3 menorahs in the WShop: Glass Menorah, NEW Ornate Menorah, & Wooden Menorah. 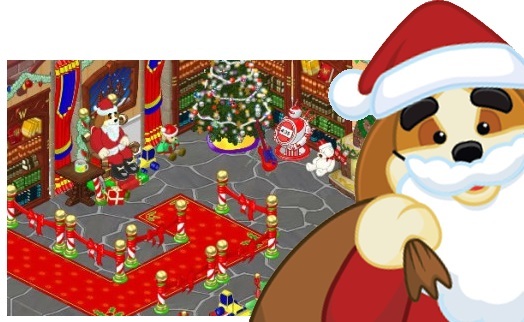 Our Countdown to Christmas event returns on December 14th! 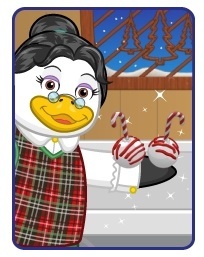 Each day until Christmas, look for Ms. Birdy in the SantaKinz Room of the Clubhouse to collect prizes. 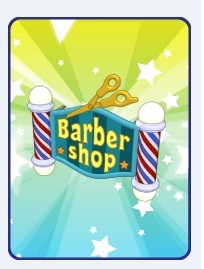 Deluxe Day is Saturday, December 8th – the special prize is a Barbershop Sign! 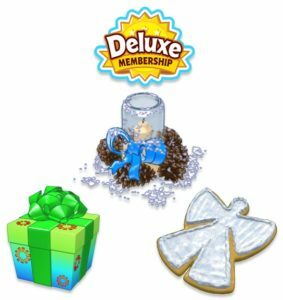 The December Deluxe Challenge starts on December 1st. 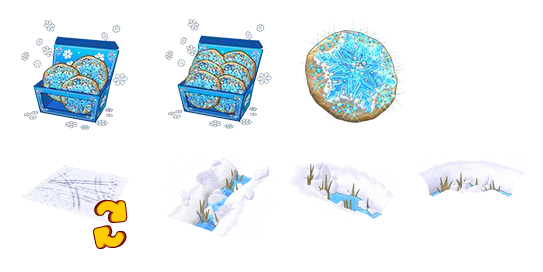 Prizes include the It’s Fun To Be Young Gift Box, a Whimsical Winter Candle, and a Snow Angel Cookie! 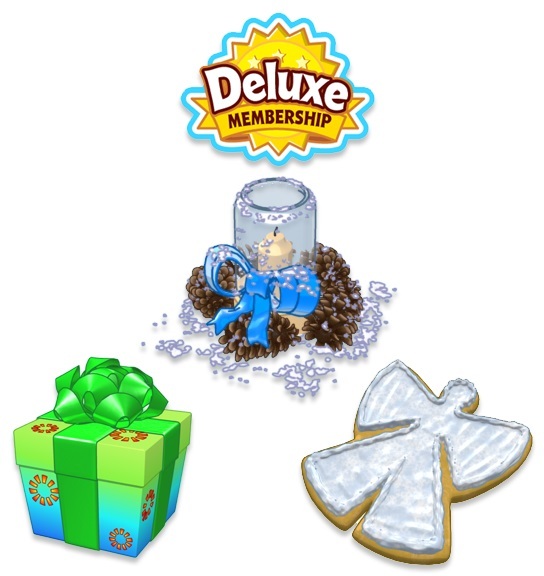 Deluxe Members receive a monthly gift box containing their choice of a Cozy Condo item, a Deluxe Pet Medallion Box (containing 10 random Pet Medallions), and a special piece of clothing that can’t be found anywhere else! December’s Deluxe clothing item is a Festive Wreath Hat! We have more of your favorite Days of Play December 8th until December 15th! Log on to your account each day to receive bonus plays for some of your favorite Magical Forest activities! The prizes on the Wheel of Wow for web and mobile, along with the Wheel of Deluxe have been updated! Don’t forget to tune in to Webkinz Newz on Saturday, November 24th for Dr. Quack’s Mayor of Kinzville re-election campaign speech!